Metal Inert Gas Welding or MIG welding as it is commonly known is the most popular type of welding. This is because out of all the welding methods it is considered to be the easiest to learn. It is not as messy and requires very little cleanup. This is because it causes less splattering. Additionally, it has a higher rate of productivity than most of the welding machines. It is also considered to be of low cost. When it comes to welding, a wire feeder welding machine is a good investment and can pay off in the long run. You may be thinking of getting into welding but the first question you should ask your self is what type of welding do I want to do. Here we take you through the different types of MIG welding to make your choice easy. There are basically four types of MIG welding. The welder, in this case, is required to pulsate the voltage instead of a steady voltage supply. This causes a mix of spray and globular dispersal of the melted wire. This results in more efficiency and provides greater flexibility when it comes to positions. It also does not require high voltage. In this method, the metal touches the welding wire. A short circuit is created by the electricity that passes through the gun causing the welding wire to melt. The melted wire drips on to the metal surface and the melted puddle creates the joint. Low voltage and carbon dioxide shielding gas are required. In this process the amount of shielding gas needed is minimal. As the name suggests, the voltage and gas cause the wire to melt, rather than dripping the droplets get sprayed onto the joints. It tends to produce a hissing sound as the wire is released like mist onto the joint. Here, a gas mixture that contains 15% of Carbon dioxide or argon shielding gas can be used. Here you will need argon shielding gas and a high voltage. The combination of these enables the wire to melt. It collects at the tip of the gun. It is kind of slow as the wire drips only a few times per second onto the joint. Also, this method is prone to splattering. So now you may be wondering how to go about this process. Here is how it is done. 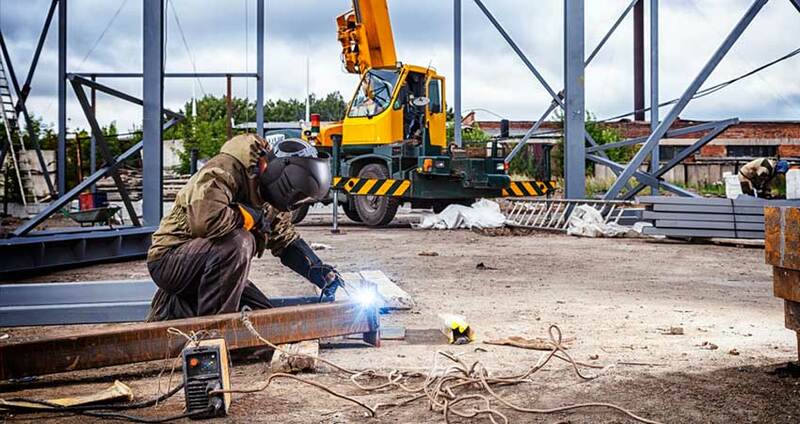 Safety is the foremost requirement before embarking on any welding project. You must make sure that you have your safety apparel. You will need a bandana or cap to protect your head from splatter and sparks and safety glasses for your eyes. Also, you will need to protect your body by wearing full-length pants without cuffs and a long sleeve jacket that is flame resistant. To protect your feet, make sure to have leather shoes or boots. You need to prepare your metals and equipment. First, clean your metal using a metal brush or grinder. MIG welding does not do well on any surface with rust, oil or dirt. Electrical interference will also affect performance. For your equipment make sure to check that your cables are okay. Also, ensure electrode polarity is on reveres or positive. Check the tension on the wire spool hub and drive rolls and finally remove splatter on contact tubes and replace the worn out contact tips. Select your wires and gas. Then determine how much voltage and amperage you will need. This will depend on different variables like your metal type and thickness, welding positions and joint configuration. Determine your wire stick out level to avoid errors. Determine which technique you will use. You can choose the forehand technique or the backhand technique. Make sure to select the correct travel angle to avoid instability. Know the precise work angles for best output. Finally, select a position to work with. There are generally four positions depending on the type of work which include the flat, horizontal, vertical and overhead positions. Talking about the best welding machine is relative to what your needs may be. Different projects require different capabilities. Heavy duty welding will require more power. The difficulty and ease of the project will also be a determinant in the kind of machine that you will require to purchase. No doubt there are some machines that come with power, durability and convenience. With a good welding machine shaping metal will be easy and stress free. Here below we examine some of the best machines in the market. These machines have not only been tried and tested but have been proven to be the top performers in their category. This Forney easy weld as the name suggests is easy to use. It is a simple set up welding machine. It can be used right out of the box, just plug and use. The FC MIG Welder Start-Up Kit has everything you need to use. You need not purchase any accessories or complementary tools for you to begin using the machine. It comes with a MIG gun, gloves, headgear, a 5/8 and ½-inch welding nozzle, and a ground clamp. The headgear has a shield that is stylish and offers maximum visibility. It is also lighter than most head gears making it comfortable and convenient. When it comes to safety, all have been taken into account. For one the headgear is light and fireproof. The MIG weld has dual optical sensors that work to prevent arc flash. For convenience, this welder does not require any gas to use. Just plug and weld. Also, the handle is placed at the top. This makes it more comfortable to use. This weld is full of additional features. It has an in-built control with a low/high and sensitivity option. A selector knob makes it easy for you to make shade changes. The SUNCOO MIG Welder is a welding machine that is easy to set up and use. It is convenient for beginners and those that prefer to use a simple to operate the machine. To begin with, this machine is made from durable and long lasting material. The stainless steel frame make-up pf the machine is sure to last you a long time. The machine itself is painted with weatherproof long-lasting paint. The machine is also less messy as it uses flux-cored wire. This means that the operation of the machine is gasless. It also uses a self- release inert gas when welding which prevents oxidation of the welded part. The machine has a 4-point control that allows you to control the current of the flow. The machine also has a control for the speed at which the wire is fed. This means that according to the kind of work you have you can adjust your current flow settings. It has a thermal safety protection that will ensure that your machine will not burn out due to overheating. Safety is important and so this machine is fitted with some safety features. First of all the machine has a thermal control that ensures that regulates your machine to prevent high temperatures and machine burn out. The machine also comes with a welding wire mask that is fireproof to keep you safe. The machine is very convenient to use as it can easily be moved around. This is due to the fact that it is lightweight. When it comes to the wire feeding, it is being done for you as the feeding is automatically done. The Hobart handler is a very simplistically made MIG welding machine that is easy to use. For those just beginning to venture into welding this machine is a joy to use. Also for some of you who would just rather use a simple machine then look no further. For starters, this machine is the full combo. Here I mean that it comes with all the necessary things needed to weld. It comes with the wire and flux. All you need to do to be up and welding id just select the voltage you require and the speed you like. The 500559 Handler has voltage handler that can be set in 5 different positions. This makes fine tuning your arc easier and more accurate. Having a smooth stable arc with uniform thickness is not a thing that will give you challenges. Quality is assured and this machine is going to give you a long time of service. MIG welding is preferred for many reasons. To start of it is a welding process that is considered to be economical yet highly productive. Secondly, MIG welding is versatile. This means that it can be used to weld all the available alloys and metals that are commercially available. Another reason that MIG welding is popular is that it allows welding in any position; you just need to select the proper parameters and equipment. Talking about equipment it is important to note that with this type of welding you do not have to be an expert to do it. Defects are highly unlikely in your end products as the process provides an uninterrupted electrode with high power that also eliminates on stops and starts. Welding speeds and weld deposition rates are higher than those with stick welding and produce fewer fumes. Also cleaning up is easier because it has no covering slag on weld bead. And finally, it has a wide selection of filler diameters and metal compositions so it can weld both thick and thin material. Well for starters the equipment is more complicated, bulkier and costlier. It also produces higher radiation and heat levels and may be very uncomfortable to weld. The welding arc and gas shield must be protected from drafts lest the shielding is blown away. This method is therefore not recommended for use outdoors. The welding torch may be cumbersome to use to reach constricted areas. Also, the deposition rates of the weld tend to be fewer. If the metal base is not clean, this method does not work well and fusion may be unattainable where parameters are not accurate. When investing in a welding machine you need to know what exactly you require. Most importantly, consider what it is that you would like to use the machine for. What kind of jobs will you do most of the time? You need to get a welding machine that gives you enough power to complete the job at hand. Also, you need to consider a machine that is durable and effective. In this article, we have furnished you with all the information that you will need to make an informed choice. Further, we have given you a list of the best in the market. Drop us a line if you have any queries. We are happy to help and as always safety comes first.